One prominent father-son duo of “gentleman farmers” with a strong connection to Hingham were both named Samuel Downer. 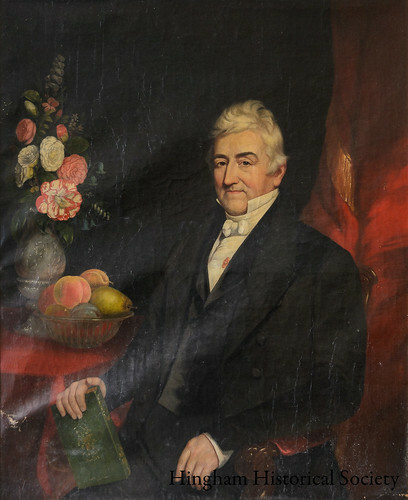 The father, Samuel Downer, Sr. (1773-1854), was a Dorchester merchant with ties to shipping and the Massachusetts maritime economy. He was a founder of the Massachusetts Horticultural Society and devoted horticultural experimentalist, known for having developed several new varieties of pears. We have in our collection a portrait of the elder Mr. Downer, painted by Henry Cheever Pratt in 1840. Mr. Downer chose to pose with fruit and flowers and a popular naturalistic work of the era called The Romance of Nature—all reflecting his desire to be remembered for his agricultural interests and not the trade and commerce that had led to his wealth and position. His son, Samuel Downer, Jr. (1807-1881), was a pioneer in the development of kerosene and a participant in early petroleum exploration in Pennsylvania. (Locally, he is known for having bought up most of Crow Point in Hingham and developed the mid-19th century resort Melville Garden.) This Samuel Downer (photo at right) also cultivated fruit for a hobby. One of his inventions was “Downer’s Late Cherry,” a useful application of scientific principles to farming: it bore fruit later than other varieties of cherry, effectively extending the local cherry season. 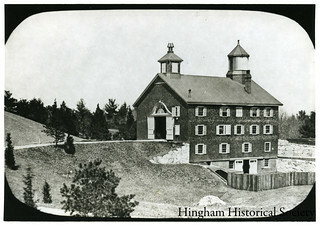 The Hingham Agricultural and Horticultural Society, founded in 1869, was also comprised of local men and women, many of whom were involved in industry, trade, and commerce. (Here, they pose for a formal portrait in front of Hingham’s Agricultural Hall in the late 1880s or early 1890s.) As a society, they were earnestly dedicated to scientific farming, that is, using the progressive values of the 19th century and the power of new knowledge and industrial technology to “improve” agriculture along “modern” lines. At the agricultural fair each fall, prizes offered in different categories attracted many entrants. One could win a medal or ribbon—and an accompanying cash prize–for anything from crops and livestock to flowers and preserves.